I received a free ARC of Salt Sugar Fat by Michael Moss from Goodreads.com’s First Reads giveaway program. Salt Sugar Fat will be released on February 26, 2013. 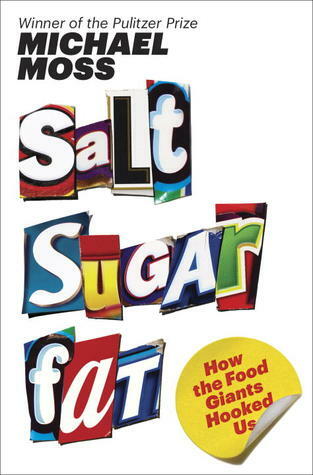 Salt Sugar Fat is not so much an eye-opening account (because anyone paying attention should know foods heavy in these are not good for you), but rather an illuminating social history of the processed food industry, going beyond these three simple components as mere ingredients and deeper into the psychology, marketing, and engineering of processed food that have so many Americans literally addicted. What goes on behind the scenes is equally fascinating and appalling. Michael Moss covers a wide array of food industry corporations, how they got started (often humbly), and how (unsurprisingly) money ultimately drives every move they make now. Nothing in your grocery store is an accident, from scientifically engineered “bliss points” of flavor to “mouthfeel” of texture to “permission” to eat as much as you’d like. Research and development and innovative food science are highly involved, as well as admittedly brilliant marketing strategies. They get us hooked on how amazing something tastes and they do this by figuring out exactly what to do so the food chemically reacts in our brains to elicit pleasurable emotions, which only make us want to buy more and more. Of course, all these products are dangerous cesspools of high sodium, saturated fats, and more sugar than anyone should have in a single day. Branding and commercials aimed at children hook a “heavy user” for life. Finding ways to make the product cheap also drives customers to buy, because in today’s bleak economy and busy lifestyle, who has the resources and time to prepare three healthful sit-down meals a day? It’s a vicious cycle driven by profits, and despite being the main source of blame for the obesity epidemic in the United States (not to mention rising rates of diabetes and hypertension), the food corporations lobby to get out of any culpability and resist changing recipes and formulas. The solution for consumers is obvious, but not always so easy—we are ultimately in charge of deciding what we put into our bodies. I always do my best in the grocery store, buying mostly produce and getting higher-quality ingredients to cook meals at home. I only very rarely buy any of the foods discussed in Salt Sugar Fat (I do like corn chips and salsa, for example, and cheese—not going to claim I’m perfect here), but I do recognize how powerfully suggestive the industry can be, especially to those with little economic stature. Some of the more shocking revelations in the book for me involved Lunchables (developed in Madison, Wisconsin—my hometown), the process of making fruit juice concentrate, line extensions (myriad versions/flavors of a product: think of all the kinds of Oreos or Cheetos you can buy, even potato chips—salt & vinegar, salt & pepper, sour cream & onion, etc. ), and especially the shamefully aggressive marketing to children. I also learned a lot about the war on home economics class by General Mills via the Betty Crocker brand. It’s also sad that so many of the pioneers of processed food got into the business with good intentions, trying to create products that were meant to be enjoyed only once in a great while as a treat (and not a daily major component of a person’s diet), and that they do not indulge in the very products they helped invent because they know exactly what goes into it and they know better. The industry became a monster beyond their control. If you have any interest in food and health in the United States, food science, or even marketing, this is a great book to check out. Ranks right up there with Fast Food Nation and The Omnivore’s Dilemma for me. Salt Sugar Fat was my selection for “published in 2013” on the 2013 Eclectic Reader Challenge, hosted by Shelleyrae at book’d out, and my third read of twelve books total for the challenge. Read from January 31 to February 9, 2013. This entry was posted in books and tagged 2013 eclectic reader challenge, economics, food, health, history, non-fiction, scientific research by kristin @ my little heart melodies. Bookmark the permalink. It definitely is—I’m so glad I won a copy of this one! I totally have to read this. Great review girl! Thanks! I saw a big copy+paste typo I had in here (corrected). I hope you get a chance to read this one—very interesting behind-the-scenes look at the industry.